Note: Our School Assemblies and Corporate Motivational Programs are a non-religious motivational program. It is our heart to work with an event host or coordinator to plan the perfect event that fits the area of focus they desire. Most programs fall into 3 types of categories in reference to the size of program/production for an area or areas of focus listed below. This is our portable, flexible, cost-effective demonstration that features hand demonstrations only with a message of the gospel or non-religious motivational message in schools. This type of presentation and demonstration has all the same characteristics of the “Small” Event except we spice it up with 2-4 power brick breaking demonstrations. 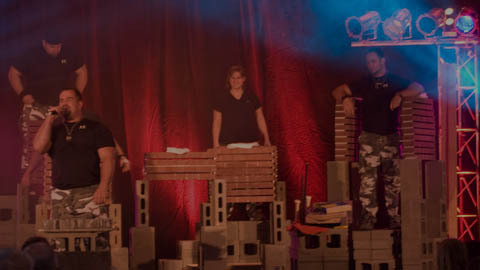 This type of presentation and demonstration is our full size production and demonstration event that be done in a community for an event or multiple events! It not only has all the components of a “Small or Medium” event but many more power brick breaks and other demonstrations included.